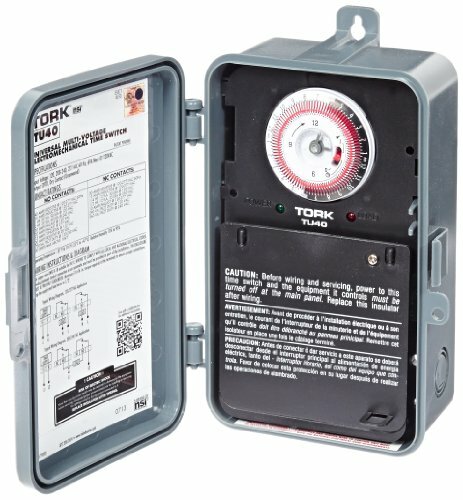 The reliable indoor/outdoor TORK TU40 timer is designed for residential and commercial use for a variety of loads required to be automatically turned on and off during a 24-hour cycle when operation is required at the same time every day. The timer allows you to set your air conditioner or heavy-duty appliances including heaters, pumps, signs, fans and lamps to automatically turn on and off, helping you to save energy and money, while adding convenience to today's busy lifestyles. When used for lighting, the timer is compatible with incandescent, compact fluorescent and LED light bulbs and can provide home or office safety and security by turning lights on while you are away. The timer detects input voltage automatically and features multiple on/off settings. You can program your appliances to turn on for as little as 15-minute intervals. The dial accommodates up to 96 pairs of tripper tabs. The timer also features a Vacation Mode and a ON/AUTO/OFF switch. For wiring, the timer features 4 in 1 DPDT contacts to include SPST, SPDT and DPST. Additional NO Contact ratings for Motor: 120-Volt, 1 HP, 30 FLA, 90 LRA and 240-Volt, 2 HP 20 FLA, 60 LRA. NC Contact ratings include: 120-277-Volt, 50/60 Hz, 30-Amp Resistive, 15-Amp Inductive/120-Volt, 10-Amp, 277-Volt, 10-Amp Ballast. Pilot Duty: 125-Volt, 290VA, 240-Volt, 360VA. Motor: 120-Volt, 1/4 HP, 12 FLA, 30 LRA and 250-Volt, 1/2 HP, 12 FLA, 33 LRA. Timer features a heavy-duty plastic NEMA 3R Indoor/Outdoor rated lockable enclosure. TORK has been a pioneer in the mechanical time switch industry since 1922.